On May 21 and 22, 2015, the Committee on the Rights of the Child considered the combined third to fifth periodic report of Ghana on the situation of the implementation of the Convention on the Rights of the Child in the country. The delegation of Ghana was led by Hon.Nana Oye Lithur, Minister of Gender, Children and Social Protection, and Ms. Laadi Ayamba, Chair person, Parliamentary Select Committee. On this occasion, IBFAN presented an alternative report to inform the CRC Committee on the situation of infant and young child feeding in Ghana. IBFAN report highlighted the declining trend in breastfeeding rates, particularly the exclusive breastfeeding rate under 6 months (63% in 2008 to 45.7% in 2011) and early initiation of breastfeeding (52% in 2008 to 45.9% in 2011). This situation is closely connected with the inadequate funding to implement the policies and actions plans on Child Health and Nutrition. In Ghana, the InternationalCode of Marketing of Breastmilk Substitutes is fully implemented through the BreastfeedingPromotion Regulation 2000 (BPR 2000). However, the Committee in charge of monitoring its implementation was found inactive due to the lack of commitment from the Food and Drugs Authority which results in systematic violations. In addition, despite the pre- and in-service training programs aimed at health workers and courses provided by the Ghana Health Service with the support of UNICEF, WHO and other partners, the need for more trained counsellors in health facilities was underlined. The report finally flagged the short duration of the maternity leave which does not cover women working in the informal sector. Finally, the lack of emergency preparedness plan with specific guidelines to ensure protection and support of breastfeeding in emergencies was pointed out. During its discussion with Ghana, the CRC Committee addressed specifically the issue of breastfeeding. It expressed concerned about the high neonatal mortality rate and the decline of exclusive breastfeeding due to the insufficient monitoring on the implementation of the BPR 2000 and the subsequent violations of the International Code. It asked which measures will be taken to this particular issue and asked for more information on breastfeeding promotion to mothers as well as on the implementation of an adequate monitoring and sanction mechanism to enforce the BPR 2000. First of all, the delegation admitted the lack of financial resources allocated to health. Regarding neonatal mortality, the delegation stated that a new Sub-Committee composed of government representatives, medical staff, technicians and community health workers has been established in 2012. It aims to design and launch a national action plan for the period 2014 to 2018. In addition, a national meeting on neonatal mortality will be held in July 2015, bringing together all relevant partners at national level, including community health workers. In relation to the persistent high maternal mortality rates, the delegation highlighted the implementation of a policy on free antenatal and delivery care for all women. As a result, the latest demographical and health survey showed that 97% of pregnant women receive antenatal care and 74% of births are attended by a skilled health professional. Besides, specific trainings are delivered so that midwives are enabled to deliver services at community level, especially in the most remote areas, and physicians as well as technicians are enabled to deal with perinatal conditions such as post-partum hemorrhage. The government recently started a pilot project to provide women delivering at home (30% of pregnant women), a tablet of misoprostol to prevent hemorrhages. The delegation also explained that pregnant teenage girls are granted with free access to antenatal care, although they still sometimes face discrimination on the ground. 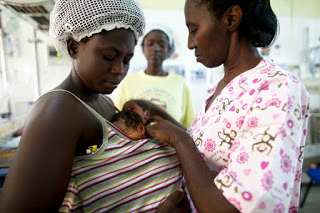 Besides, the delegation admitted that the rate of exclusive breastfeeding under 6 months declined between 2008 and 2011. To remedy this situation, the government took measure to increase awareness of health workers through specific trainings. The government also stressed its commitment to strengthen the implementation of the Baby-Friendly Hospital Initiative as well as to enforce the BPR 2000, resulting in the slow rise of the rate of exclusive breastfeeding. Finally, the delegation declared that misleading advertisements have been reduced since the entering into force of the BPR 200. However, it admitted that baby food manufacturers are still trying to influence health professionals through sponsorship of seminars and conferences. In its Concluding Observations, the Committee referred directly and indirectly to infant and young child feeding. The Committee first recommended Ghana to improve its data collection system (§16). Then, referring to its General Comment No 16 (2013) on State obligations regarding the impact of the business sector on children’s rights, the Committee urged the State party to establish clear regulations and a nation-wide legislative framework requiring companies operating in the State party to adopt measures to prevent and mitigate their adverse child impact of their operations in the country (§20a) and to require companies to undertake assessments, consultations, and full public disclosure of the environmental, health-related and human rights impacts of their business activities and their plans to address such impacts (§20b). Regarding health, the Committee expressed concerns about the insufficient funding allocated to health, the low number of qualified and experienced health provider staff as well as an inequitable provision of health services (§49 a-b). Therefore, it called for the allocation of sufficient financial and human resources, particularly to child health and nutrition, providing effecting access to trained and qualified health care (§50a). The Committee also highlighted the continuous high maternal and neonatal mortality rates in the State (§49f), stressing AIDS as one of the causes of child mortality (§53c). Thus, it recommended Ghana to reduce mortality rates by improving parental care (§50c) and by providing access to antiretroviral therapy and followed-up treatment for HIV/AIDS infected mothers and their children (§54b, d). It also urged the State party to finalize the National Newborn Strategy and Action Plan (§50b), to improve prenatal care, to prevent communicable diseases (§50c), to implement the OHCHR Technical guidance on child mortality (A/HRC/27/31) (§50h) and to expedite the approval of the National Nutritional policy (§50f). Regarding breastfeeding, the Committee expressed specific concerns about the decline of breastfeeding rates between 2008 and 2011 and the inadequate monitoring of the BPR 2000 (§49d). It thus recommended Ghana to “continue the promotion of exclusive breastfeeding for six months with appropriate introduction of infant and diet thereafter, aimed at reducing neonatal as under-five mortality” (§50d) and strengthen the monitoring of implementation of the BPR by implementing a deterrent sanctioning system and ensuring that the Food and Drug Authority is committed to enforce the BPR (§50e).